Washington gets a “C” on new Infrastructure Report Card: That’s not good enough. 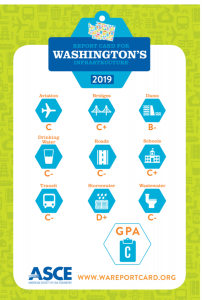 Today the American Society of Civil Engineers handed Washington a “C” grade on its 2019 Infrastructure Report Card. This is the same grade as the state received on the 2013 report card. As the graphic above shows, the report card assesses nine dimensions. Our state remains in the solid C category, with a high of a B- (dams) and a low of D+ (stormwater). As the ASCE points out, infrastructure matters. Infrastructure supports our economy and our way of life. In Washington, our infrastructure allows us to thrive in diverse climates and topographies. Our transit systems, including the largest ferry operation in the U.S., allows us to inhabit islands in Puget Sound and off the coast, while our road and bridge maintenance programs facilitate the necessary repair of infrastructure in climates ranging from temperate rainforests to dry deserts. Our infrastructure also protects our pristine natural resources from human development. The group acknowledges efforts have been made to improve. For a long time, underinvestment at all levels of government threatened our competitive advantage and the health, safety, and welfare of our residents. Fortunately, the state and many local governments have taken recent measures to provide additional support for our infrastructure. While the new funding and higher prioritization is welcome, additional steps can still be taken to ensure Washington’s infrastructure is fit for the future. Leverage sustainable loan programs to finance necessary infrastructure projects around Washington. Balance the needs of urban and rural communities. Meet the demands of a growing population. Lead in environmental sustainability and resilience to natural disasters. There’s a lot of good information in the report, consistent and with and expanding on themes we address in our Connect priority for transportation and Employ priority on economic vitality. Explore the interactive features in the 2019 report to get quick access to data on each of the nine categories graded. One important finding: Washington’s grades have improved on all transportation elements. There’s still a lot of room for improvement. Read the full report for all the detail.